»5 Best Places To Witness Fireflies Near Mumbai! 5 Best Places To Witness Fireflies Near Mumbai! Fireflies, the twinkling insects that belong to the family of beetles, are intriguing bugs that light up the night. 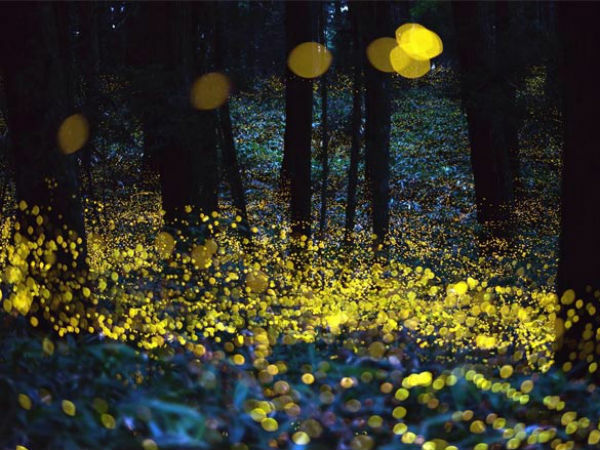 Fireflies light up due to a bioluminescent reaction that takes place in their bodies. These insects glint brightly particularly during monsoon, since it is their time to woo the lady fireflies! Male fireflies, each have their own unique lighting pattern that they use to impress the females. In fact, some researchers speculate that they have over 2000 moves. The females observe the performance and once they find their suitor, they reciprocate with a certain lighting pattern. Such is the fascinating story of fireflies! Now, you may not notice these minute details, but what you can witness are hundreds of these fireflies glittering in the laps of nature. What's more, these places are just a drive away! Mumbaikers, these are the places you need to visit if you wish to see these twinkling firelies in the beautiful night sky. The best way to experience watching fireflies in any of the following places is by trekking to the region's peak point. You can contact the trekking groups in Mumbai that regularly plan hikes to these places. Ideally, the best time to watch these fireflies are during the pre-monsoon months of May and June. Particularly during the first two weeks of June because it is the peak mating season for fireflies. These months will also be perfect for trekking in these regions, since the weather will be pleasant, with the temperature shifting from the summer heat to a cool, rainy monsoon. The hill station of Bhandardara is located just 142 km from Mumbai and serves as a great spot for watching glinting fireflies. The place is packed with nature's beauty like beautiful waterfalls, peaks, lakes and lush greenery. The best place to view fireflies is from the top of Kalsubai Peak. A day's trek up the peak and a camp in the night will be the perfect setting for a quiet weekend. Located just about 174 km from Mumbai and 164 km from Pune, Purushwadi is a brilliant getaway, particularly since it is a hotspot for watching fireflies. During the first week of June, Purushwadi is filled with tourist's and visitor's camps who are in the village to view hundreds of beautiful fireflies. In fact, certain organisations conduct the Purushwadi Firefly Festival, where they curate this whole experience by providing all that you need to stay for a night. The magnificent relic of Shivaji Maharaj's rule is the Rajmachi Fort. This fort which used to be the capital of the Maratha dynasty, is now a popular spot for trekking. And during monsoon, the trek up to the fort will give you a breathtaking experience of viewing those glinting fireflies! There are two routes to trek to the fort. The one day trek can be ended by camping on the top and viewing the fireflies. It is located just 94 km from Mumbai. Sandhan Valley is located in the hill station of Igatpuri, at a distance of 122 km from Mumbai. This is another enthralling site to view fireflies. Sandhan Valley is also a popular place for trekking, where trekking clubs regularly plan to go for a one day hike. After the trek and watching fireflies, you can even spend a day visiting other places in Igatpuri like the Bhatsa River Valley, Trignalwadi Fort, etc. Located at a distance of 284 km, Dang Forest is mostly known for the Dang Darbar, which is a dance festival held right before the festival of colours, Holi. During the day, you can see beautiful arrays of bird species like parrots, sparrows, egrets, kites, drongos, to name a few. But once the sky turns dark, fireflies will be all you see! A day spent in the Dang Forest can give you the perfect getaway into nature, since you can spend the day birdwatching and see fireflies in the night. There are guided tours available to Dang Forest that give you all kinds of information about the forest.